The material on this website is updated regularly but no guarantees are offered or implied that the information presented is the latest available or has not been superseded by other information. Users of this site should be aware that Somerset Eye Institute may modify the Terms and Conditions of Use at any time, and such modifications shall be effective immediately upon posting. Your continued usage of this site will mean you accept these changes. You agree to review the Terms and Condition of Use periodically to be aware of such modifications and your accessing or using this site constitutes your acceptance of the Terms and Conditions of Use as it appears at the time of your access or use. The information contained on this site is provided without charge for general informational purposes only. It is important to know that this site is not intended as a substitute for professional medical advice, diagnosis or treatment. Always seek the advice of your physician or other qualified health provider with any questions you may have regarding your medical care, conditions, or treatment. Never disregard professional medical advices or delay seeking medical care because of something you have read on this site. If you think you might have a medical emergency, call your doctor or 911 immediately! Somerset Eye Institute does not recommend or endorse any specific tests, procedures, opinions or other information that may be referred to on this site other than those provided at Somerset Eye Institute. Reliance on any information on this site that is provided by Somerset Eye Institute, its employees or others appearing on this site is strictly and solely at your own risk. This site is intended for personal, non-commercial, informational use only. The content of this sight is protected by copyright, thus no materials from the site may be copied, reproduced, republished, uploaded, posted, transmitted or distributed in anyway, except that you may download one copy of the materials on any single computer for your personal, non-commercial use, provided that you keep intact all copyright and other proprietary notices and you make no downloads. Users should always be aware when using this site that information will be transmitted over the Internet, a medium that is beyond the control of Somerset Eye Institute. Accordingly, Somerset Eye Institute assumes no liability for or relating to the delay, failure, interruption, or corruption of any data or other information transmitted in connection with use of this site. Although reasonable efforts are made to ensure that the information posted on this site is reliable, this website and its content are provided on an “as is” basis. Somerset Eye Institute, its officers, directors and employees, and its affiliated entities, to the fullest extent permitted by law, do not make any representations or warranties, either expressed or implied, as to the quality, accuracy, appropriateness, or completeness of information on this site. In no event shall Somerset Eye Institute, its licensors, suppliers, or any third-parties mentioned on this site be liable for any damages (including, without limitation, incidental and consequential damages, personal injury/wrongful death lost profits, or damages resulting from lost data or business interruption) resulting for the use or inability to use this site whether based on warranty, contract, tor or any other legal theory, and whether or not Somerset Eye Institute is advised of the possibility of such damages. Somerset Eye Institute is not liable for any personal injury, including death, caused by your use or misuse of this site. Somerset Eye Institute does not endorse the content of any third-party website links that might appear on this site. Somerset Eye Institute does not take responsibility for linked third-part sites, or third-party advertisements, and does not make any representations regarding their content or accuracy. Your use of third-party websites is at your own risk and subject to terms and condition for use for such site. Somerset Eye Institute does not endorse any product advertised on this site. Somerset Eye Institute does not wish to receive unsolicited confidential or proprietary information from you through this site. 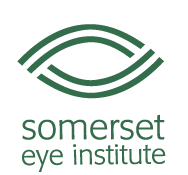 Please note that any communication, information or materials that you send to Somerset Eye Institute through this site by electronic mail or otherwise, including any data, questions, comments or suggestions, will be treated as non-confidential and non-proprietary. Somerset Eye Institute reserves the right to use any ideas, concepts, know-how and techniques contained in any communication sent to this site for any purpose whatsoever, including but not limited to developing, manufacturing and marketing products using such information. Notwithstanding the foregoing policy, Somerset Eye Institute may, on occasion, specifically invite site users to provide personal information when registering for a specific service through the site, voluntarily completing and submitting electronic questionnaires, or otherwise responding to direct requests for such information from the site. Information collected by Somerset Eye Institute for these purposes is protected in accordance with our Privacy Pledge and Notice of Privacy Practices. Physician Disclaimer: Physicians performing services at our facility may be independent contractors and not our employees, agents or representatives.